our open season running from April to mid- November. distribution to soup kitchens and food pantries in our area. at VolunteerMatch.com to Master Gardeners. A couple of pictures at the Farm on 7-22-15, and the produce we took to Forgotten Harvest the next day. homeowners. 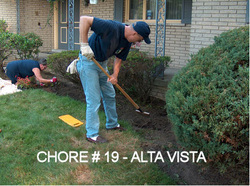 Bushes are trimmed, weeds are pulled, beds are mulched, and flowers are planted to spiff up the front yard. neighborhood down and stay longer in their homes. resources at this gem of a City park. signage at Evergreen Woods Park this year. 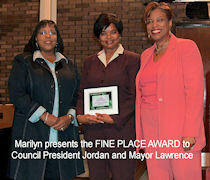 The Club awards "Fine Place Awards" to outstanding places in Southfield. neighborhood home gardens in our 10th annual Garden Walk. project in the John Grace Neighborhood on May 3. We pick up litter on our streets.